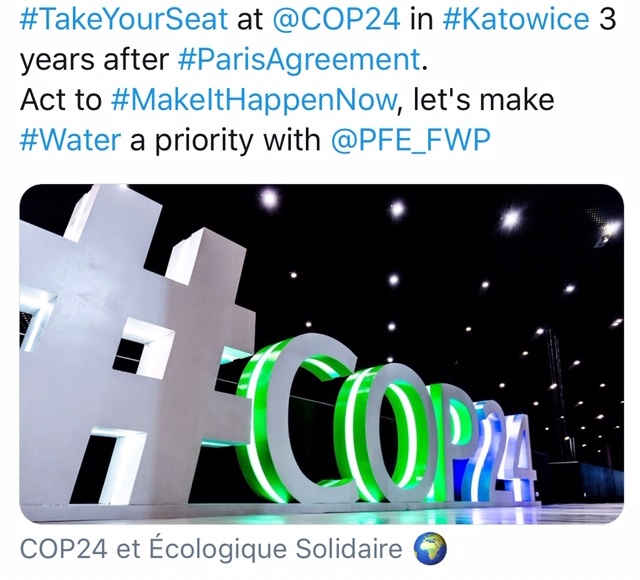 Follow day by day French Water Partnership and its members on live Twitter from Katowice in Poland where negotiators and civil society will debate about climate change issues. 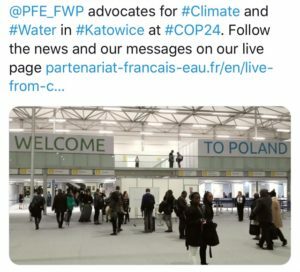 Take a look at the photos of the COP24 on the FWP’s Flickr account. 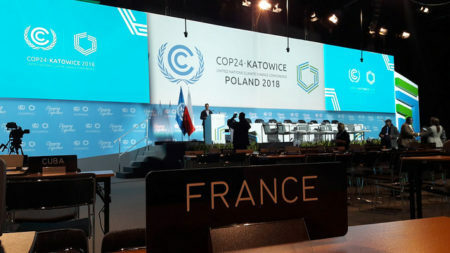 After an unfortunate first week of negotiations, closed on Saturday afternoon 8 by the refusal of 4 countries (United States, Kuwait, Russia and Saudi Arabia) to “welcome” the IPCC Special Report on Global Warming of 1.5°C in the SBSTA subsidiary body, the start of the high-level phase was highly anticipated. 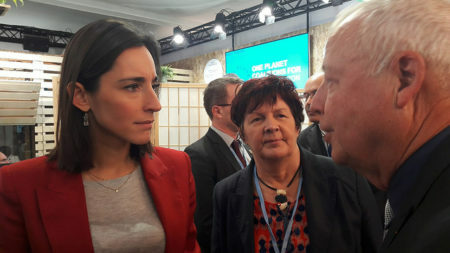 The ministerial round table organized on Monday afternoon 10 on climate finance was the opportunity for Brune Poirson, Secretary of State to the Minister of Ecological and Solidarity Transition, to announce the increase of the contribution of France to climate finance. French public funding for the climate will increase from 3 billion euros per year in 2015 to 5 billion euros per year in 2020. The share devoted to climate change adaptation will increase from 1 to 1.5 billion euros per year. 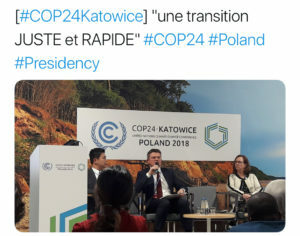 In addition, France will contribute 15 million euros to the climate change adaptation fund for developing countries and 20 million euros to the Least Developed Countries Fund. The various Ministers also stressed the need for a major consultation in the countries between the Ministers of Economy and the Environment, the obligation of transparency to reinforce the confidence of investors and the importance of associating public and private financing. The Talanoa dialogue entered in its political phase on Tuesday 11. 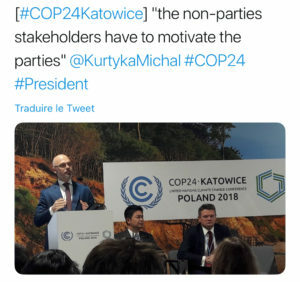 On this occasion, Laurent Fabius, President of COP 21, indicated that the efforts made in the world were not up to the ambitions set by the Paris Agreement. He called for the immediate strengthening of political will, especially in terms of funding. The Presidency of the COP convened a stocktaking session on Tuesday at the end of the day given the lack of progress. During this meeting, Mr. Kurtyka noted that the texts proposed by the Chairs of the APA, SBSTA and SBI remain largely in deadlock situations. 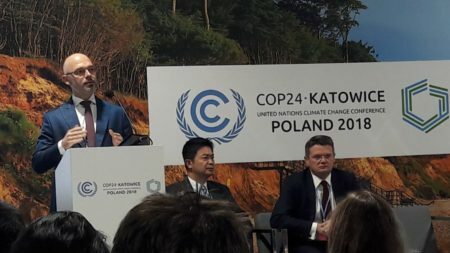 He said that new proposals will be made by the Polish Presidency in collaboration with tandems of North-South ministers on the following issues: financing, transparency, NDC register, global stocktake, adaptation. 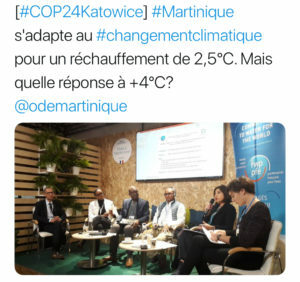 Two issues have been recurrent in recent days: the inclusion of IPCC work in the texts and the topic of common but differentiated responsibilities. The activities of the FWP were also dense at the beginning of the second week. Jean Launay, President of the FWP, met twice with Brune Poirson, Secretary of State, to draw his attention to the need to carry out as soon as possible the French Roadmap for the implementation of SDG 6. A clear link exists in these actions with climate change. 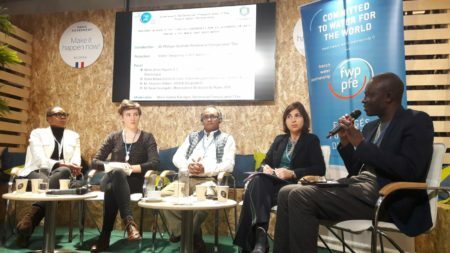 The last side-event organized by the FWP on Tuesday 11th at the Francophonie Pavilion was the occasion to discuss its IPCC 1.5 °C report’s synthesis with regard to water resources. Gathering around the table Jean Jouzel (climatologist), Jean Luc Redaud (President of the FWP climate working group), Bettina Laville (President of Comité 21) and Joseph Kogbe (international coordinator of the Climate and Development Network), this event allowed to recall the major issues for water in scenarios at +1.5 °C and + 2°C. The discussion led to the emergence of early reflections on strengthening the complementarity between adaptation, mitigation and development. 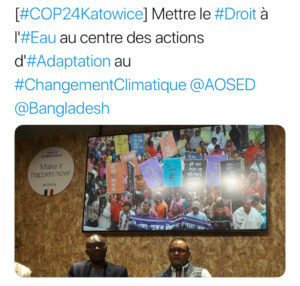 Jean Luc Redaud also spoke on behalf of the PFE in the event on adaptation to climate change organized by Comité 21 on the French Pavilion. The end of the first week of this COP was very stimulating for the FWP and the water sector. 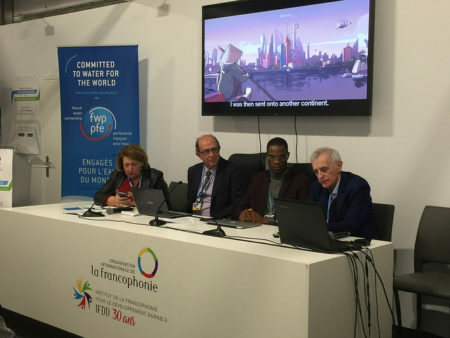 The video “Imagining a + 4 ° C world: what about water” was officially launched on the occasion of an event on the French Pavilion on Thursday 6th. 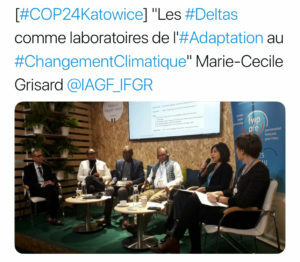 The panel highlighted cases of concrete studies and solutions put in place by the territorial actors in Martinique (Office de l’Eau in Martinique), in the Niger basin, in Bangladesh, as well as in the Camargue and Mekong deltas (Initiatives for the Future of Great Rivers). 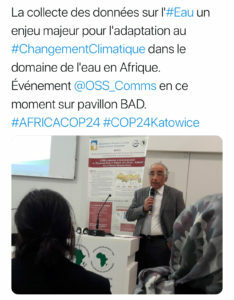 On Friday the 11th, during the official side-event co-organized by the FWP, the INBO and the Sahara and Sahel Observatory on water & climate and on the funding of the adaptation, Philippe Guettier recalled the broad messages and recommendations carried out by the FWP at this COP. The event focused mainly on African issues with representatives from the Lake Victoria Basin, the Interstate Committee for Drought Control in the Sahel, a South African NGO and the World Bank. 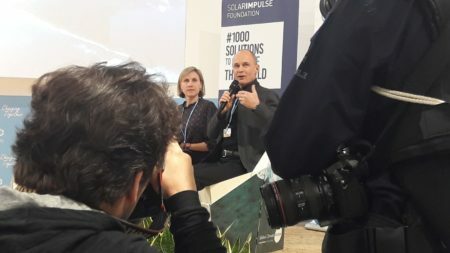 The afternoon of the 11th was an afternoon on water and it was opened by the Polish high-level climate champion Tomasz Chruszczow as well as Bertrand Piccard, initiator of the Solar Impulse Foundation. 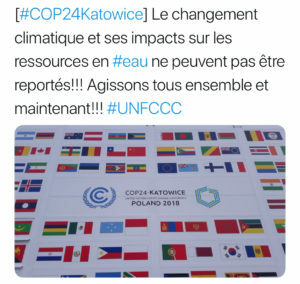 The fact that media representatives were able to open the afternoon gave all the more visibility to the issue of water in climate negotiations. It was followed by the screening of the +4°C film by the FWP. The following two panels helped give voice to various actors who have created bridges with other sectors (agriculture, energy, industry, etc.). 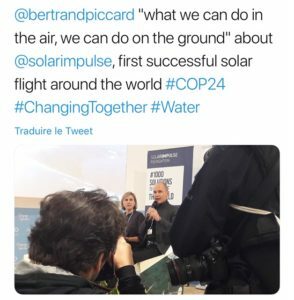 This afternoon on water was the first step in the implementation of a collaboration initiated almost a year ago between the FWP and the Solar Impulse Foundation. 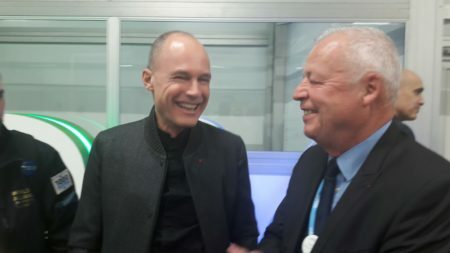 The FWP advocated for Bertrand Piccard to open this event and promoted exchanges between his team and the present water stakeholders. This collaboration will be continued in the coming months to help the foundation identify good innovative projects in the field of water. In the same direction, a rapprochement with the World Water Council is suggested. 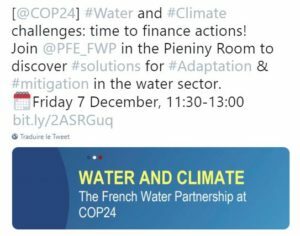 On Saturday, a short event was co-organized at the Action Hub by the FWP and the Global Alliances for Water and Climate. 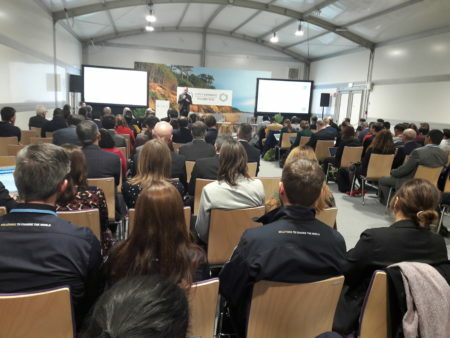 This event acted as the official inauguration of the brand new nature4water platform. 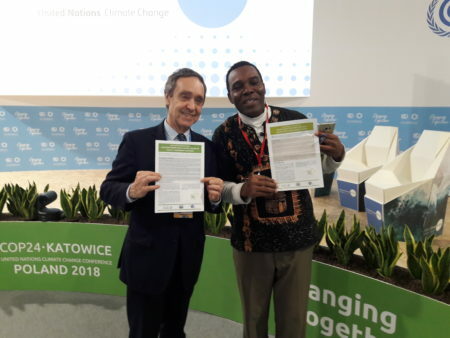 Members of the audience were also invited and encouraged to sign the International Declaration on Nature-based Solutions for Water under Climate Change. 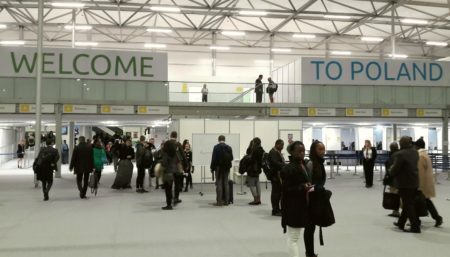 In parallel, numerous bilateral exchanges were organized, notably with the President of the Senegalese preparatory committee of the Dakar World Water Forum. 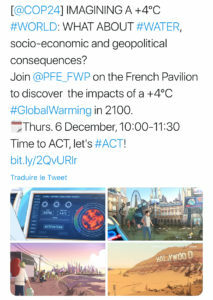 Jean Launay, the President of the FWP, has been invited to participate in various sessions, in particular for the launch of the guide on water and sanitation services and climate change by the Programme Solidarité Eau (Water Solidarity Programme), but also in a big event on water & climate organized by INBO on the Pavillon de la Francophonie. 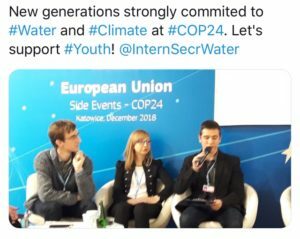 Philippe Guettier intervened in a session organized by the International Secretariat for Water aiming to connect young project leaders with experts in the water sector. These exchanges highlighted two challenges: the need for collective organization among the local populations for the success of the projects, as well as the definition of sustainable economic models. At the same time, negotiators continued to seek agreements on the implementation texts of the Paris Agreement. For now, it seems that the dyanmics and the tactics developed by the different states prevent reaching consensus. Some progress has been made on indigenous peoples but there remain significant and persistent blockages on all topics related to funding. 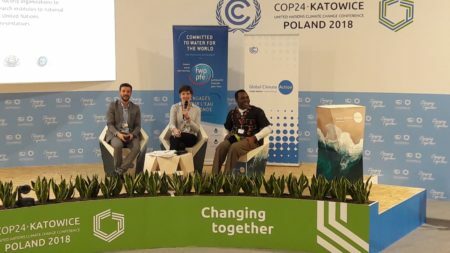 Strong disagreements arose during the SBSTA plenary on Saturday 9th in the afternoon on the issue of the inclusion of the IPCC Special Report 1.5 ° C in the SBTSA decision texts. The FWP team is preparing for the high-level phase that will start on Monday the 10th and that will allow to have more visibility on the political commitments beyond the very technical discussions of this first week. 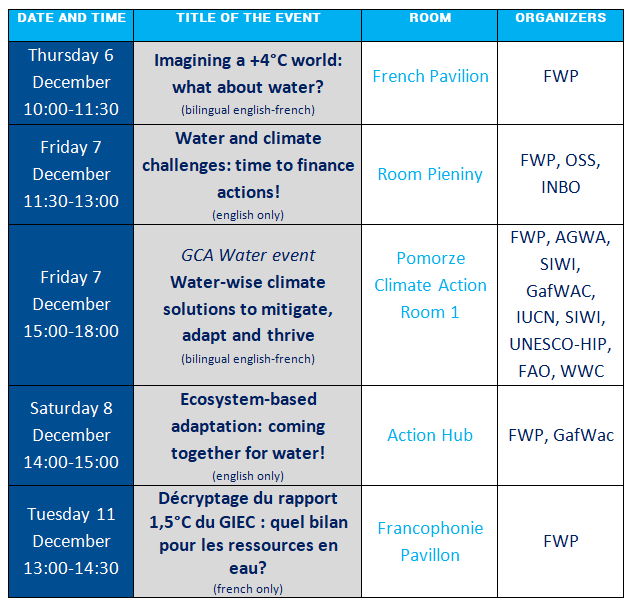 A last FWP event will take place on Tuesday 11th from 13:00 to 14:30 on the OIF Pavilion: the FWP will present its keys to understanding the 1.5 ° C IPCC report from the point of view of water resources. 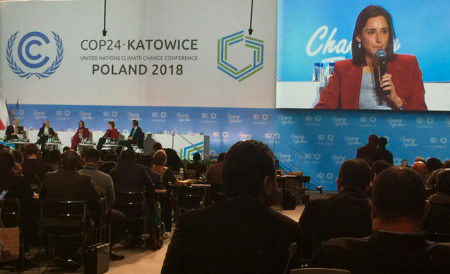 The first days of COP24 were marked by a series of high-level opening sessions. In parallel, the technical negotiations – mostly informal – were initiated. 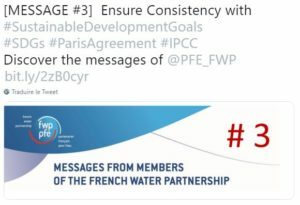 The purpose of the latter is to bring out texts setting out the rules for implementing the Paris Agreement, particularly those relating to the monitoring and review of commitments. Part of the discussion focused on the synchronization of NDC calendars, references to their content and their fields of application. Discussions also focused on climate finance, capacity building, communication on adaptation, transparency and the global stocktake. Overall, these negotiation meetings seem to be taking place in a constructive spirit, although it is difficult to say at this stage that they will lead to solid and ambitious texts. A Parties / Non-Parties dialogue was held on Wednesday 5, but discussions focused mainly on mitigation. The representative of the FWP was able to request that this dialogue integrate adaptation (water is the first subject concerned). 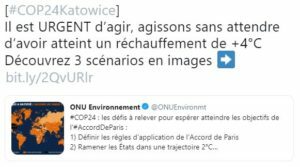 The Polish Presidency has indicated that it will work for this issue to be taken into account in the negotiations in addition to mitigation in accordance with the Paris Agreement. The choice made this year by the Polish Presidency to have only one area which brings together negotiators and civil society seems to favor exchanges between all the staekholders. However, civil society is less visible and active than at previous COPs, notably those in Paris and Marrakech. 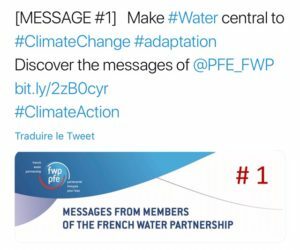 The secretariat of the French Water Partnership has been on site since Tuesday 4. It has a booth in zone C of the COP (booth n ° 99) and will be organizing several side-events as of Thursday. Its Director spoke yesterday at an event organized by the Nownet network of Partnerships of developed countries related to water. He highlighted the need to foster dialogues between all actors at all levels to strengthen the fight against climate change. 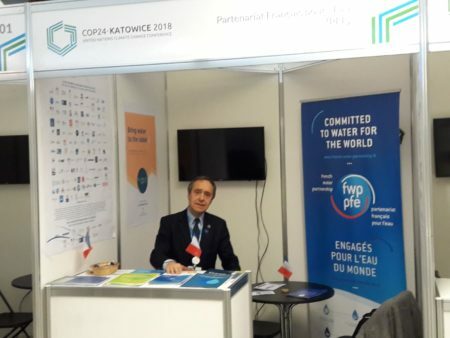 The French water stakeholders are progressively making their way to Katowice. In total, about thirty members of the FWP will be coming to defend the cause of water during these two weeks. 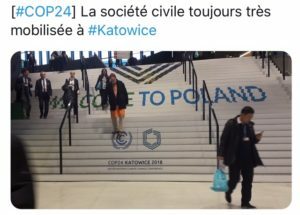 You will also find more information on our COP24 page.